Facebook can be a very effective tool for the purpose of finding your target market and then driving potential customers to your website. Your website should be the online hub of your brand. not Facebook. Here's why. The trend for small businesses and start-ups, in Costa Rica especially, is to choose a Facebook page over a website to promote their business and products. Most business owners we speak to have a Facebook page as their sole online marketing presence. While social media is certainly an important part of a larger, online marketing strategy, it is not an effective branding or marketing tool when used alone. Even though part of our income comes from creating and maintaining websites, our primary goal at Maya Creative Group is to work with our clients in integrating and utilizing the best available online marketing options to reach their target market. While there are some exceptions to the rule, rarely is it the case that Facebook is the best and only option for reaching their marketing goals. Facebook owns your Facebook page, not you. Because they own it, they can make changes to the designs, layouts and policies at any time which can negatively impact your business presence and your brand. Because you don’t own the Page, there’s absolutely nothing you can do to stop Facebook from making these changes. Also, Facebook can remove your business or personal page at any time and without notice. Remember, Facebook is a free service, and you get what you pay for. Weird and uncomfortable, right? Your customers can view advertising from your competitor while viewing your Facebook Page. As a matter of fact, your competitors can specifically target the kind of people visiting your Facebook Page based on their profile and browsing history. I’m pretty sure you wouldn’t put your competitors’ ads on your website, so do you really want to funnel all your online traffic to a place that allows this? Of course not! Search engines like Google place greater importance on a website than on a Facebook page, especially for local search (those searches conducted geographically close to your business). 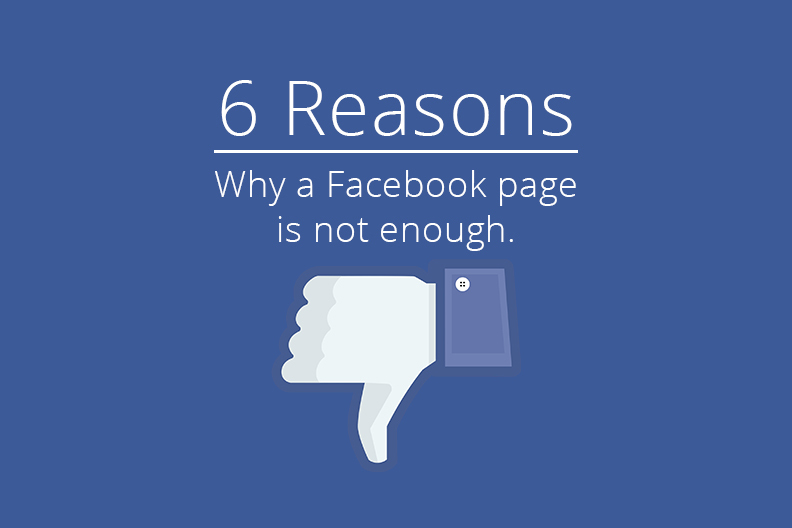 While a business Facebook Page will usually show up, it generally won’t rank as high as a website would. And because you don’t have control over the factors that effect the ranking of your Facebook Page, the results will likely never be as strong and might not even appear in search results that would normally be highly relevant to your business. Most websites receive most of their traffic through organic Google search, not through Facebook, paid or otherwise. Why? Because of the sheer number of people using Google, with a website you cast a broader net. Google search is currently registering about 3.5 billion searches per day, or 1.2 trillion searches per year, while there are currently only 500 million people on Facebook worldwide. While Facebook Insights have improved and will probably continue to expand over time, the current Facebook analytics aren’t nearly as good or helpful as what you can get from your own website. With your own website and a free Google Analytics account, you receive far more information on your visitor traffic. While you don’t get names and addresses, you have access to an incredible amount of data, including ages, locations, languages spoken, your most popular pages, referral sources, most clicked on areas of your site, and how long people stay on your site. All of this is invaluable information for the online marketing of your business. Facebook is seriously limited from a design standpoint, and it’s not always possible to present your company or your brand in the way you want. I mean, let’s face it, you’re competing with a lot of blue on Facebook. You’re also limited in the size and shape of key content areas. After you enter all your information, images and logo, your Facebook page will still look like, well, Facebook. With your own website, you can publish what you want exactly how you want it. The bottom line is, if branding is an important component of your marketing strategy, Facebook alone just isn’t going to cut the mustard. Not everyone is on social media networking sites. 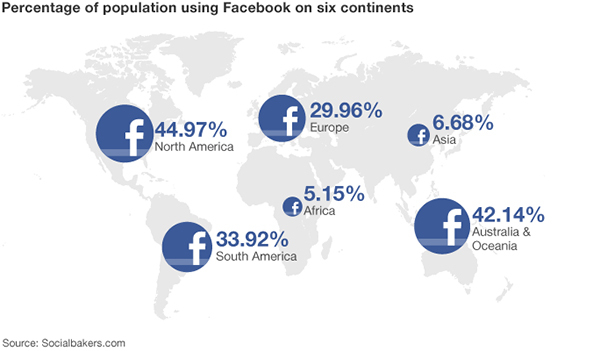 Depending on the source, research has found that anywhere from 30-45% of internet users in the US don’t use Facebook, and in Costa Rica that number is closer to 65%. While Facebook is a great way to add options to how consumers can interact with you, you may be eliminating more than half of your potential customers if you limit your business to only a Facebook Page. In the past year Facebook rolled out some major changes for businesses, which resulted in a big reduction in your overall organic reach for each post. To increase your reach, you must advertise with Facebook. There is no denying that Facebook is valuable to your business and should be an important part of a broad online marketing strategy. When looking for a branding and marketing hub, however, nothing works better than a website. About the Author: Hollie Niblett is the owner and Content Strategist at Maya Creative Group. She has been in the business of online publications, sales and marketing since 2009, after spending many years managing programs and working with at-risk youth for non-profit and government agencies. She is a native Okie currently living in Costa Rica with her husband and daughter.